From time to time we receive reports, stories, rumours about locomotives that have fallen into lakes, rivers or swamps and have been left there. We will list these here by province together with any corroborating evidence we can obtain. It should be emphasized that many of these stories are just that - a story with no hard evidence to back it up. Anderson Lake Pacific Great Eastern 2-8-0 #56 hit a rock slide and fell into Anderson Lake on August 12, 1944. #56 remains in Anderson Lake. Kaslo Lake Canadian Pacific 2-8-0 No. 3512 fell off a barge in Slocan Lake on 31 December 1946. See 'The Shipwrecked Hogger', CRHA #256A of May 1973 which also refers to page 83 of Bulletin Number 83 of the Railway & Locomotive Historical Society of Boston, Massachusetts, U.S.A.
Seton Lake Pacific Great Eastern 2-8-0 #53 hit a rock slide at Mile 117 on January 3, 1950, and derailed into Seton Lake, killing the engineer and fireman. #53 remains in Seton Lake. "Constructed in Kingston" by Donald McQueen and William Thompson page 231. In September 1919, all the Moguls (serial 1233 to 1238) were sold to the CNR becoming C-5-b 415-420, including the ill-fated McArthur 22. It had derailed into the mud of Armstrong Lake, Manitoba, from a failed trestle in 1915. Because recovery was anticipated, it was assigned a CNR road number in 1919, but CNR subsequently abandoned it as a submerged wreck in October 1920. Saint John River, Canadian Pacific, Shogomoc Subdivision, mileage 82.7. RS18 8739 is still buried in a washout near Bath, NB., which occurred on 1 April 1976. It was officially retired on 12 May 1976. Lakefield From Paul Delamere August 2014 - correspondence with Gordon Young Editor of Lakefield Heritage Society. There were at least two derailments on the Grand Trunk "missing link" near Lindsay. 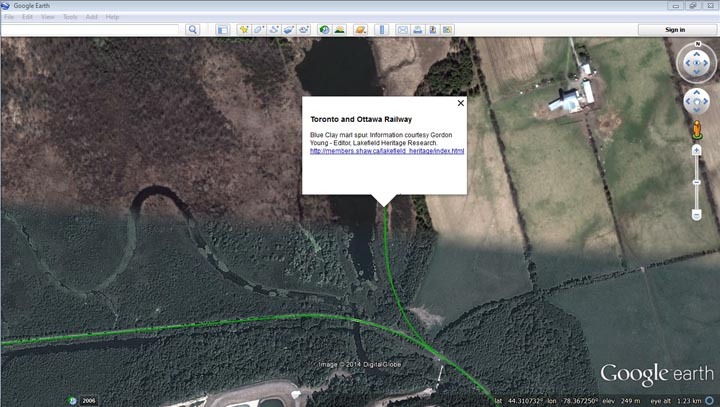 The area is very soft and the derailments took place at the switch to the spur on the east end of Lilly Lake. From the west edge of Jackson Park, out over the swamp between the Jackson Park boundary to what is now Ackison Road, then across Ackison Road to Lily Lake Road as it angles northwest towards Lindsay. . Around 1900 a locomotive, tender and two cars were derailed. The locomotive and tender were recovered but the two cars were left in the swamp. About 1906 a second train derailed at this switch and two cars in the swamp were not recovered. In neither case was the locomotive abandoned. A bid to locate a locomotive that sank into a lake 104 years ago has been launched. It was on June 10, 1910, that the engine and tender of Canadian Pacific Railway D10 4-6-0 No. 694 and two carriages derailed after striking rocks and slid 65ft down an embankment into Lake Superior in Ontario. The driver, fireman and brakeman died. Scuba divers are now searching for the wreck. The Lake Superior Steam Locomotive Group and the Municipality of Schreiber are working with Discovery Charters to rediscover the wreck believed to be lying in about 200ft of water 45 miles east of Schreiber. The aim of the expedition is merely to photograph the locomotive and confirm its identity. No items will be removed from the site at this stage, but the ultimate intention is to display relics in a local railway museum. A total of 502 D10 'Ten Wheelers' were built between 1905-13, making them the largest class of engines used by Canadian Pacific in the 20th century. Extremely versatile yet built to a simple design, they were used in passenger, freight and yard service until the end of the steam era in the early 1960s. Seven survived into preservation. Lake Superior Steam Locomotive Group spokesman Doug Strefurak said he would ideally like to see No. 694 raised from the lake but believes the cost would be prohibitive. On 19 November 2014 OKthePK reported "Recently divers located the locomotive's pony wheels but the engine lies deeper in 275 feet of water near a box car found at that depth." Rossport Lake Superior Ontario - On 10 Jun 1910 Canadian Pacific Railway locomotive number 694 struck a rock slide, derailing the engine, tender, and two carriages, sending the train sliding down a 65 foot embankment into Lake Superior. The driver, fireman, and brakeman all lost their lives. The D10 4-6-0 locomotive hasn't been seen since, until now. OKthePK Joint Bar Editor: Incorrect. The engine was first photographed in 2014. A team of divers located the wreckage on 22 Jul 2016 approximately 235 feet under the lake's surface, between the towns of Schreiber and Marathon on the north shore of Lake Superior. A remotely operated underwater vehicle recorded the video found above showing the locomotive caked with years of rust and decay. One online commentator on the above footage, Will Gant, gave his impressions of the video saying, "The main rod (which attached to the cylinders) is bent completely backwards, the piston rod is still attached, but you can't tell if the piston is actually attached. The cylinder itself is broken off completely, though you can see the rear steam port, stack is missing, but the petticoat is still visible inside, bell is gone, the yoke is broken off. I think there is a good chance the builders plates might still be attached to the smokebox, didn't see obvious signs of them, but didn't see bolt hole to indicate they were missing either. Might be covered in silt on the side of the smokebox. (there is a builders plate on each side of the smokebox) There seems to be a large steel pipe that has crushed the cab, that's not part of the engine, my guess is that it is cargo or some sort, it appears to be just as rusty as the engine itself. The throttle is still on the backhead, the shiny handle is the automatic brake stand to control the train brakes. Of interest is its in the release position, meaning the brakes were not applied, so either the crew never saw what was coming, or the wreck forced it back into release (though its not broken or scratched). The Johnson bar (reverser) is still attached to the cab but is twisted out to the side of the engine. The safety valves are still attached to the auxiliary dome." During an initial dive in 2014, one of the two boxcars was located at a depth of 285 feet, 200 feet from the locomotive. There are no records of any other wrecks in the area, but the team hopes to locate the builder's plate to confirm the locomotive's identification. Between 1905 and 1913, 502 D10 class "Ten Wheelers" were built. The versatile engines were used by the Canadian Pacific Railway in passenger, freight, and yard service until the early 1960s. Seven of them have been preserved. It is not believed that CPR 694 will ever be moved from its current location. Ultimately, relics from the site may be displayed in a local museum. The team plans to return in August to take more photos and video from the site. The underwater video may be found here at YouTube. Sherkston David Gilchrest has seen two quarry locomotives in 35 feet of water in the Empire Limestone quarry at Sherkston, near Port Colbourne. The quarry and its equipment was abandoned in 1910 and was later flooded. Montreal, Turcot About ten years after the railroad began operations, two locomotives quietly disappeared into the swamps before the astonished eyes of railway workers. One belonged to the Montreal and Lachine Railroad and the other to the Grand Trunk.The latter was lost in 1855. As far as anyone knows the locomotives are still buried deep under the Turcot yards. In 1881, The Harbour Grace Railway bought five 1872 Hunslet 4-4-0Ts from the Prince Edward Island Railway: First #2, First #3, First # 4, First #5, and First #6. During a storm on the way to Newfoundland, one of these locomotives fell off the deck of the SS Merlin and was lost in the Gulf of St Lawrence. It is still wherever it landed, but despite a good scare, the Merlin made it safely to Newfoundland. Unless the ship's log is preserved somewhere, the exact location is unknown. The repatriation branch of the British heritage locomotive movement has a new subject to tantalise its members. HMS Erebus, lost in the search for the Northwest Passage by the Franklin Expedition, has been found in the Arctic's Queen Maud Gulf by a consortium of searchers headed up by the Royal Canadian Geographical Society (on September 7th, 2014). This originally all-sail ship had its steam power supplied by a locomotive, purchased by the Admiralty in 1845 from the London and Greenwich Railway, and suspended amidships. While this is not totally clear, the locomotive is thought to have been L&G R No. 4 Twells, a Robert Stephensons 1830-designed Planet-class 2-2-0 engine., Certainly, a cutaway side elevation of the ship published in the Society's magazine Canadian Geographic in December 2014 shows the front elevation of a small locomotive that looks like a Planet facing the port side of the ship. The magazine says the locomotive generated 25 horsepower, and that the as-yet undiscovered companion ship, the Terror had a 20 hp engine. "The old Marshall engine No. 4 (Twells of 1836) seems to have ended its days in interesting, but very tragic circumstances. ... a description of the departure of the expedition on the nineteenth (May 1845) ended with the following reference to the Erebus 'The screw propeller is worked by an engine of 25 horse power, which formerly ran upon the Greenwich Railway.' ... what eventually became of the ships has also remained a mystery. Abandoned in 1848 by the survivors of the expedition, themselves to perish, the two ships are believed to have sunk in Arctic waters off King William Land, Northern Canada; so at least the remnants of one Greenwich Railway engine may well exist today beneath the ice of the north-west passage." Twells was John Twells, a member of the original L&GR Railway Board of Directors. Marshall was William Marshall, proprietor of the Eagle Steam Factory, Great Bridge, Wednesbury. The locomotive was one of four he built for the L&GR in 1835, the first being the "Royal William" of which there is a (probably partly conjectural) drawing in the book. The locomotive was mounted athwartships in a well behind the mainmast and the main axle was extended to become the propeller shaft. A similar engine was on the sister ship Terror and they could move the two ships at about four miles an hour. However, they could only carry enough coal for 12 days. In the Ottawa Citizen of 13 September 2016 it was announced that the wreck of the Terror had been located, presumably with a locomotive still on board.